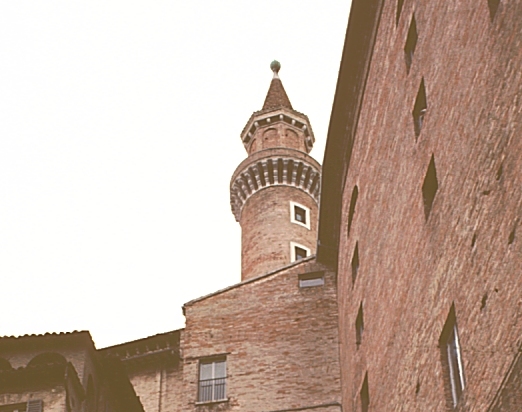 Images of Palazzo Ducale, Urbino, Italy. Digital Imaging Project: Art historical images of European and North American architecture and sculpture from classical Greek to Post-modern. Scanned from slides taken on site by Mary Ann Sullivan, Bluffton College. 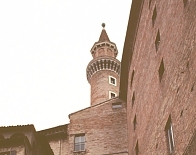 This palace was built during the 1460s for Federigo da Montefeltro, one of the most important soldiers of the early Renaissance and commander of the papal forces. (See this site for a portrait of Federigo.) 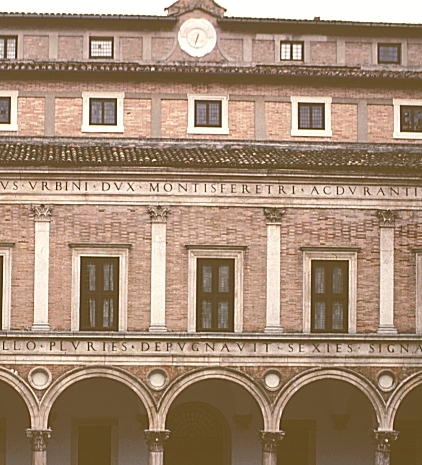 The court at Urbino, famous for its sophistication, was memorialized in literature by Castiglione's The Courtier. There are numerous difficulties about the dating and attribution of this palace. 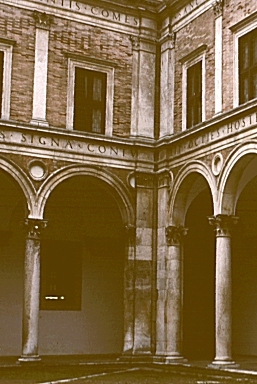 Although it was probably begun before Laurana was employed, there is clear epistolary evidence that Federigo appointed Laurana as chief architect in 1468. The palace is located on a high cliff, with only its main entrance side easily accessible. 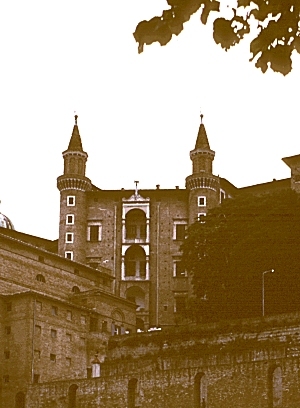 The steepest side (seen below) has two round towers with a loggia on each of the three stories, thus providing good views of the surrounding country. 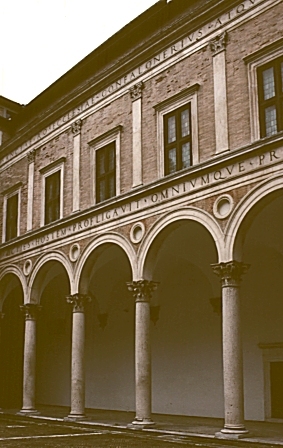 The courtyard is generally attributed to Laurana. 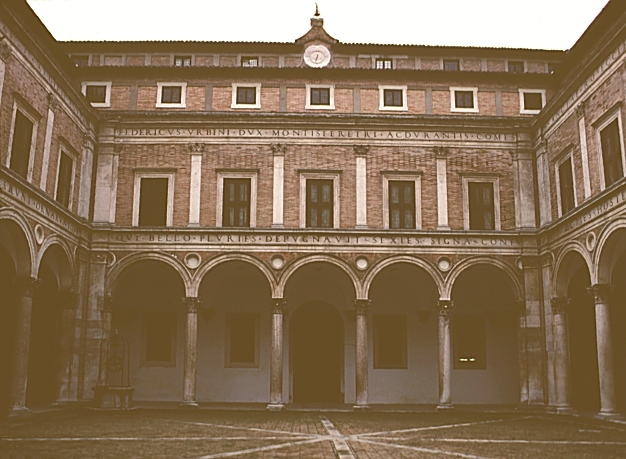 Although he was from Dalmatia (former Yugoslavia), scholars agree that he was familiar with the Florentine palace style. 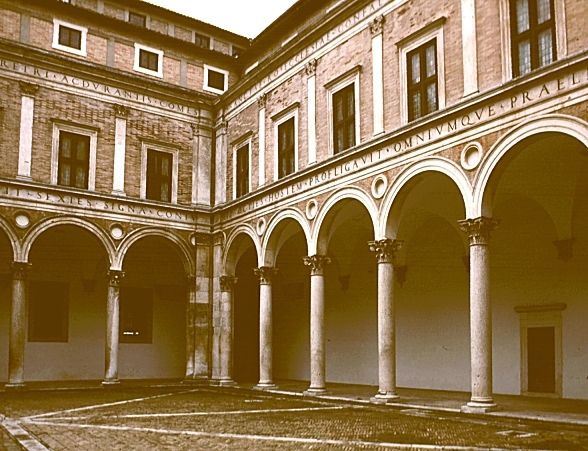 This courtyard, like the Medici-Riccardi Palace in Florence, has an open cloister on the lower story with cross vaulting supported on columns. However, Laurana improves on the earlier courtyard design. (Note that the two upper stories were added later.) The windows on the piano nobile correspond to the arches on the first story and the Corinthian pilasters echo the columns of the arcade, thus defining the bays. Not only are both stories united, but the second story does not seem too heavy for the lower arcade. In addition, the light color of the columns, pilasters, and entablature, against the darker brick, emphasizes the unified design. 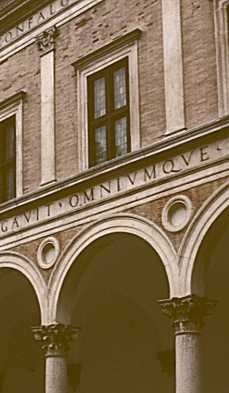 Two friezes with Latin inscriptions praise the virtues of Federigo. Laurana solved another problem. 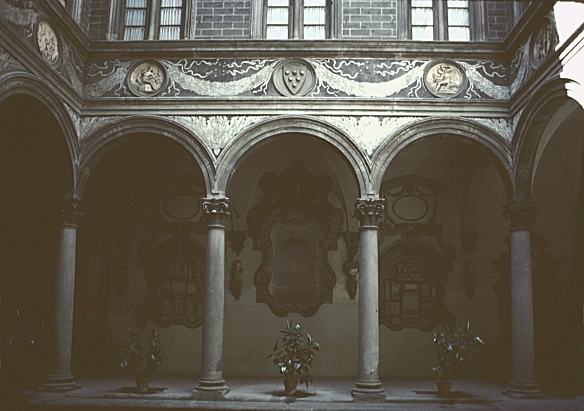 In the Medici-Ricardi Palace, for example, a single column was used where the two arches turned at right angles. 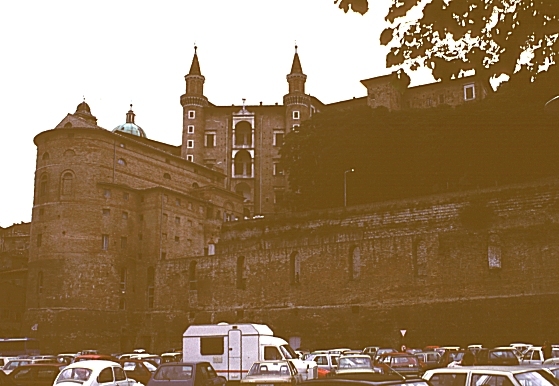 (See Medici-Riccardi corner.) Laurana, instead, completed both corner arches so that they do not share the same column. Each side of the colonnade ends with a pilaster just as each side of the second floor ends with a pilaster. Thus, on the first floor he created an "L"-shaped pier at each corner with pilasters and two half-columns--a much more graceful solution.